CHICAGO – “Everyday Sunshine: The Story of Fishbone” aspires to be more than an episode of “Behind the Music” and succeeds largely due to the amazing talent of the band it chronicles, the stunning, one-and-only Fishbone. It’s common for a critic to call a great, underrated band influential but Fishbone doesn’t really qualify because what they did was so unique that it’s impossible to copy. The documentary about them, playing Saturday night, April 16th, 2011, at the Chicago International Music & Movies Festival, expresses the band’s incredible individuality while also not quite getting a finger on what worked about them, why they weren’t bigger, or what happened later. It’s an interesting piece of filmmaking mostly due to the fact that Fishbone rules, but it’s a little light on subject matter for the length of a theatrical documentary. How do you define Fishbone? They had no real lead singer when they were formed and created such chaos on-stage that they usually knocked over all the microphone stands and just jammed. I think one of the reasons that Fishbone never took off is because radio at the time couldn’t get their finger on who the band was as artists. They didn’t fit ANYWHERE. They didn’t fit with what radio considered black music, especially after the gangsta rap trend took over that market and they were a bit too ska to be considered rock. There’s a lot of discussion (by people as knowledgeable on the music industry as Gwen Stefani, Ice-T, George Clinton, and many more) about how the lack of an easy label for Fishbone is one of the things that held them back. And yet people who got into Fishbone, sank deep. I remember a brief period of adoration for the band and I was lucky enough to see them live, where they REALLY delivered. They were such an energetic, powerful presence. There was nothing like them. In the early ’90s, they were on MTV, appeared on “Saturday Nigh Live,” and had a great video (“Sunless Saturday”) directed by Spike Lee. They seemed on the verge of breakthrough. But it never came. Most people who remember Fishbone like I do will come to “Everyday Sunshine” with a “whatever happened to them?” perspective. Some of them are still making music and are fantastic interview subjects for a music documentary, but the film never quite fills in the gaps enough for this viewer except for an interesting chapter about the mental decline of one of the founding members and the alcohol problems and power struggles that eventually came after the band failed to break. Maybe there are no other gaps to fill in. Maybe some bands just fade away as music changes, lineups change, humans err, and the band simply never finds its place in the rock landscape. What do they say about great artists not being recognized in their lifetimes? The Fishbone guys who sat down for interviews seem happy now, for the most part. But spending time with them while they call their mom, surf, and do autograph signings doesn’t have as much power as you might think. The film sags a little bit in its “hang out” time in present day in the middle of the film as those segments have a tough time matching up with the energy and vitality of the footage of the prime of the band. Clearly, that’s partially intentional — here’s this insanely talented band, and here’s how “normal” they are today. Yes, it’s amazing to me that someone as talented as Angelo Moore is struggling enough to get evicted from his apartment (as he says, “famous but not rich”), but there are thousands of talented musicians struggling in the same way. Why didn’t Angelo and the rest of the guys become millionaires? I still don’t know. Maybe there’s no answer. I like Fishbone and I like “Everyday Sunshine,” the song and the movie. The band was like nothing else out there. They were rock, soul, funk, rap, and everything in between, and people weren’t ready for that, and if you haven’t heard them, go buy as much of their music as possible. Directors Lev Anderson and Chris Metzler definitely reminded me about a band that I need to listen to again and there’s something to be said for that. I certainly don’t step away from every episode of “Behind the Music” wanting to listen to the profiled artist, so the movie surely works as a love letter to this great band. “Everyday Sunshine: The Story of Fishbone” could have been a bit stronger with a shorter running time and a bit more focus, but the band couldn’t have been more remarkable. “Everyday Sunshine: The Story of Fishbone” was directed by Lev Anderson and Chris Metzler. It plays on Saturday night, April 16th, 2011 at the Chicago International Music & Movies Festival at the Chicago Cultural Center. Submitted by Anonymous (not verified) on May 2, 2011 - 6:21pm. 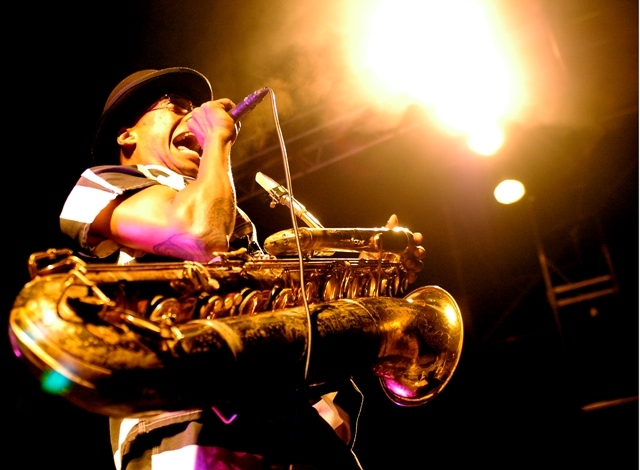 Fishbone are talented artists, that have managed to stay in the lime light while still making headlines! They also shine bright in the lime light in their new documentary!! Submitted by Anonymous (not verified) on September 13, 2011 - 11:26am. I think Fishbone is one of the best groups of ‘80’s, they have great songs.